Fr. 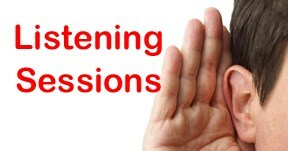 Charles and the Vestry invite all members of St. Mary's to share their ideas, hopes, and concerns at one of four listening sessions hosted in parishioners' homes. What do you value most at St. Mary's? This could include details about worship, music, adult formation, outreach, etc. In what areas do we need to improve? What sort of changes would you not want to see? Our average Sunday attendance (ASA) increased from 60 in 2017 to 79 in 2018, a 32% increase. Where do you envision our ASA in 3 years? 5 years? What do we need to do to get there? Imagine St. Mary's Church 5 years from now, when worship, music, adult formation, outreach, etc. is just the way you want it do be, what would that look like to you? Your feedback is very important. Please sign up for one of the sessions by clicking here . Flowers for adorning St. Mary's church for Easter has always been possible through the generous donations from you! 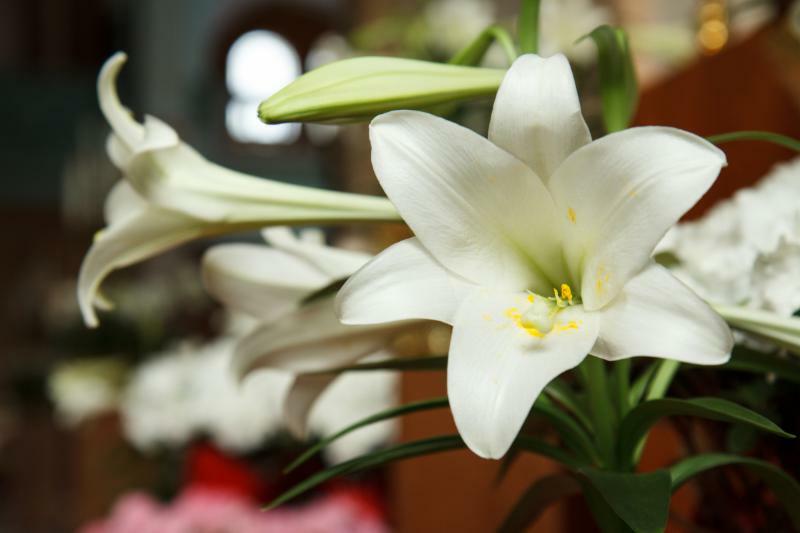 Please consider a gift to the church this year with a donation to the Easter flower fund. You may submit your contribution by clicking here . Thank you. Healing Pathway needs help hunting Easter bunnies - for a good cause! Healing Pathway is a volunteer-driven 501c3 providing services to the smallest of victims of homicide: Children ages 0-17 years who’ve lost a parent or caregiver to murder. We provide wrap around services including therapy, case management and school assistance, all at no cost. This year we are hosting a huge event on April 13 during National Crime Victim’s Week, including games and an egg hunt for our kids. 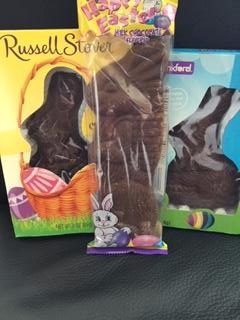 We’d like to give each child their own chocolate bunny, similar to the photo (milk, white or dark chocolate, individually boxed or wrapped, solid or hollow). We will need about 300 bunnies for the event. Commemorate the holiest week of the year and walk with Jesus as he makes his way to the cross. Enter Jerusalem with Jesus on Palm Sunday. Remember the Last Supper on Maundy Thursday. Keep watch with Jesus in the Garden of Gethsemane. Behold Christ crucified on Good Friday. Be led from darkness into light at the Great Vigil of Easter. 7 p.m. - Compline, sung by the William Jewell College choral scholars and the choral scholars of St. Mary's Church. 7:00 p.m. - Solemn High Mass with Foot Washing and Stripping of the Altar, with choir. Vigil at the Altar of Repose - beginning after the service, and ending at midnight. 7:00 p.m. - Solemn Liturgy of Good Friday, with choir. 11:05am. Holy Saturday Liturgy of the Word, including a reading of the ancient homily "The Lord's Descent into Hell." 8:00 p.m. Solemn High Mass, with choir. 10 a.m. - Solemn High Mass, with choir. Between the time that Jesus and his disciples shared the last supper and his arrest in the Garden of Gethsemane, Jesus asked his disciples to keep watch with him while he prayed and struggled with what God was asking him to do. 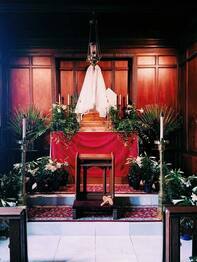 You have an opportunity to answer Jesus' request this Holy Week by keeping vigil before the Altar of Repose. At the end of the Maundy Thursday service (Thursday, April 18th at 7pm), the sacrament is removed from the Church and moved to St. George's Chapel where a candle-lit, garden-like setting will be created. A vigil will be kept before the Altar of Repose from 9:00 pm to midnight. Spending an hour of prayer and contemplation before the Altar of Repose can be a powerful experience and if you have never done it, I encourage you to try it. 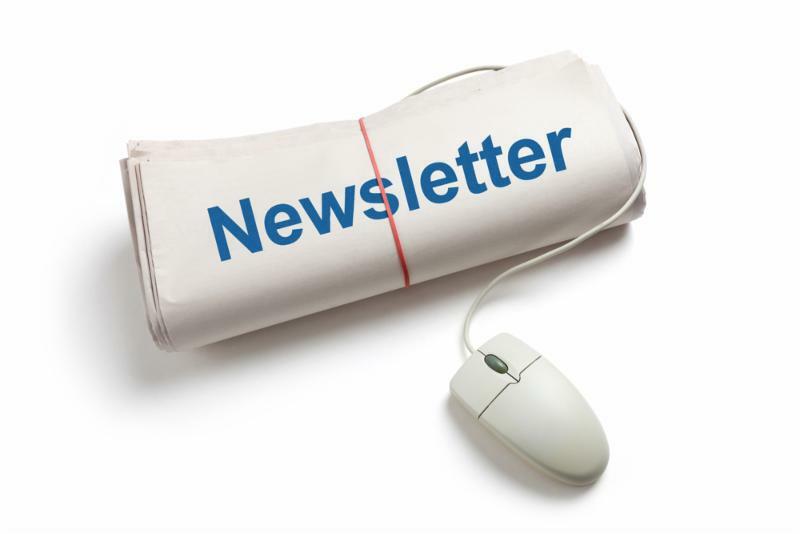 To sign up for a time slot, please click here and sign up on our website. Come with your favorite chocolate - Wine will be provided. Welcome Mary Beverage to her new apartment! Sylvia is a photographer and has spent time with wild mustangs in Wyoming. Come view her lovely photography and visit with friends. on the last Thursday of each month. Come with your unfinished hand craft and a sack lunch. 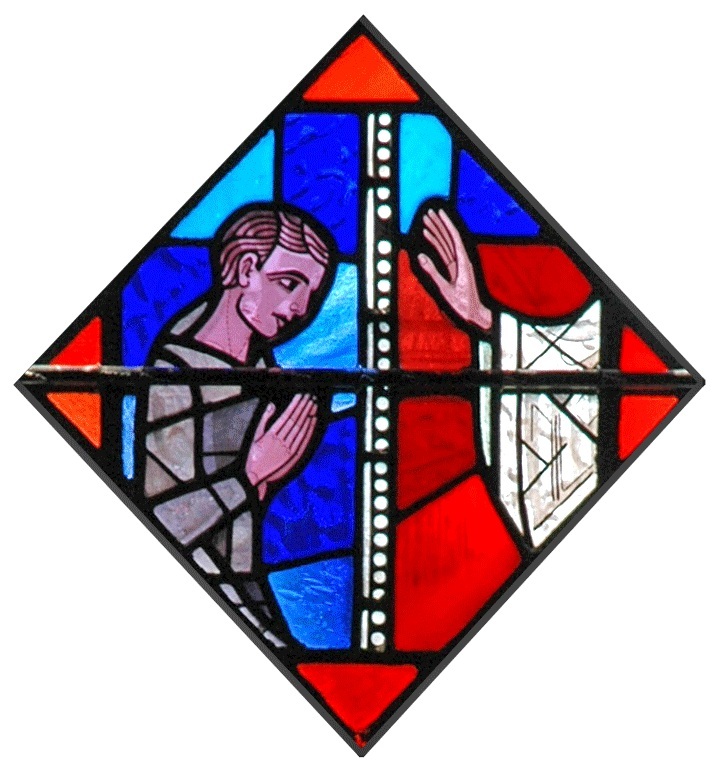 A priest will be available to offer spiritual guidance and sacramental confession in St. George's Chapel on Saturday 4/13: 1-3pm. You may also schedule time with Fr. Charles by clicking here . Did you miss Sunday's sermon? We post sermons preached on Sundays and Major Feasts on our website. You'll normally find both an audio recording and the text on this page . 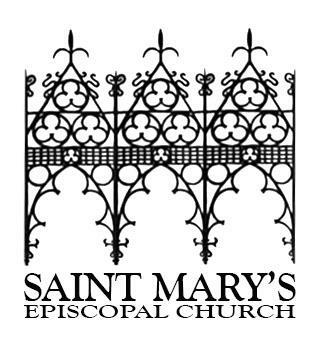 I f you experience a pastoral emergency and need to speak to a member of the St. Mary's clergy, please call 816-974-8082. This is a phone service that forwards the call to the clergyperson-on-call. If you are scheduled for surgery or a serious medical procedure, or if there is a death in your family, please let us know via phone (816-842-0975) or email . If you'd like to pray the Daily Office online, click on the image above! That link provides a "St. Mary's-style" Daily Office in Rite I language with a few Anglo-Catholic devotions added. If you feel comfortable navigating the various options in the Office and would like to set your own preferences, click here ! 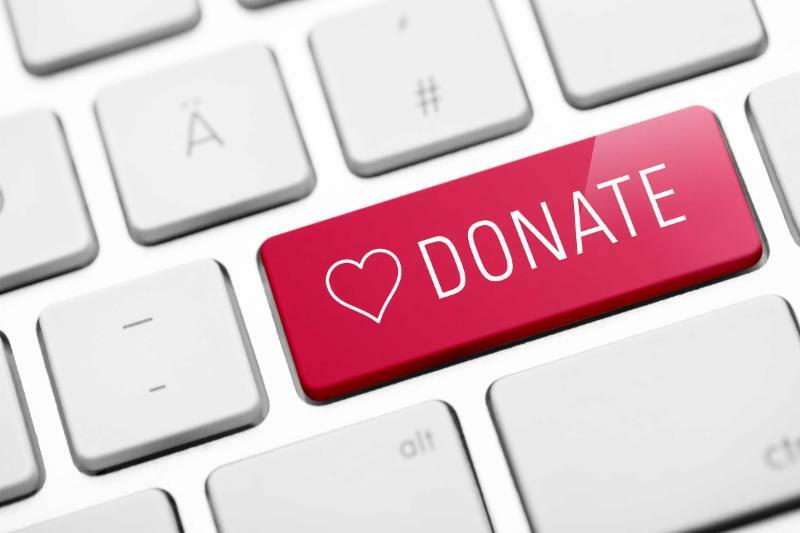 Donate to St. Mary's Online! If you'd like to schedule a recurring electronic payment, or make a one-time payment, you can now do this online via Paypal. Please click here if you'd like to make a donation to support the life and ministry of St. Mary's! Solemn High Mass: 10 a.m. Adult Forum and Soup Dinner 6:30 p.m. Please "like" our Facebook page!